Those who caught the front page of Saturday’s New York Times were witness to a brutally weird juxtaposition of stories concerning: 1.) 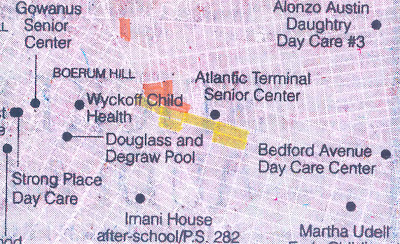 the angst of Brooklyn neighborhoods faced by city budget cuts surrounding the proposed Atlantic Yards Forest City Ratner mega-monopoly, and 2.) the frivolous focus of the Bloomberg administration on subsidizing basketball. Were the Times editors aware of the contrast they were setting up or out-of-touch with the linked import of their stories? Christina Nieves’s life revolves around a handful of blocks in Brooklyn: Drop off her 4-year-old daughter and 2-year-old son at the Strong Place day care center. Make sure her 75-year-old grandmother, who uses a wheelchair, makes it to lunch at the Gowanus Senior Center. Then, on too many occasions to count, take her son, who is asthmatic and prone to seizures, to the Wyckoff children’s clinic. And with warm days now here, watch her children frolic at the Douglass and DeGraw pool. Mayor Michael R. Bloomberg plans to close all four places. The second story, appearing right beside this tale of woe, reveled in Bloombergian PR fluff. (See: Luring a Star: Big City Beckons; Cleveland Begs, by Alan Feuer, June 4, 2010.) It really didn’t deserve to be on the front page except that it is actually critically important for its meta-story, for the way that it stands as an example of how the Times, by preoccupying itself with the dutiful and superficial pass-along of Bloomberg and Ratner promotional materials, is missing the bigger stories in this city, including how intrinsically related the tale of budget woes was to this sillier second story about luring LeBron James to play basketball in New York. Play basketball where? 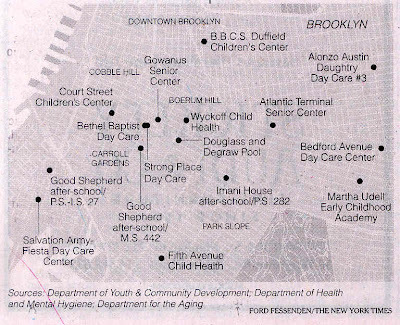 Perhaps within about a half mile of all the four community facilities the Bloomberg administration will, by closing, remove from Christina Nieves’s life. Play basketball where? Perhaps in the highly, highly subsidized Prokhorov/Ratner basketball (aka “Barclays”) arena that the City Independent Budget Office calculated will be a $220 million net loss for the city. 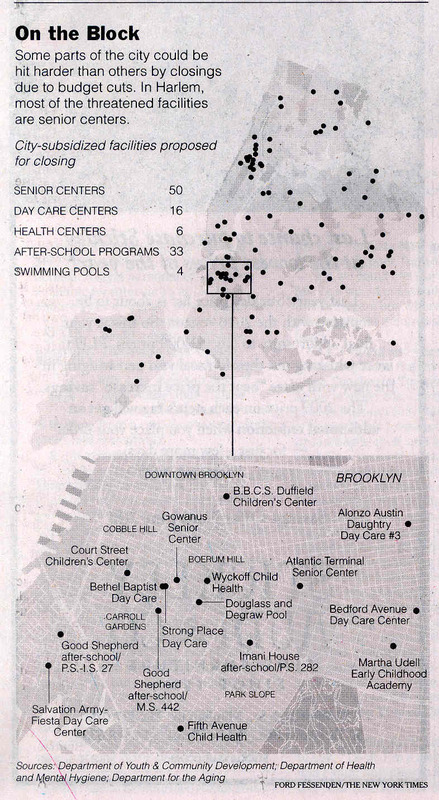 The Times also has a map on line concerning the city budget cuts which has interactive features. The Times story about the budget cuts is strong only because it puts together coverage of all the cuts as a single story rather than covering them individually. But it did not go as far as it needed to in making connections. 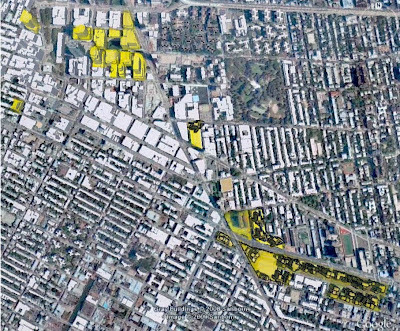 The story says that Bloomberg is trying to“plug a $5 billion gap” in the city’s budget. 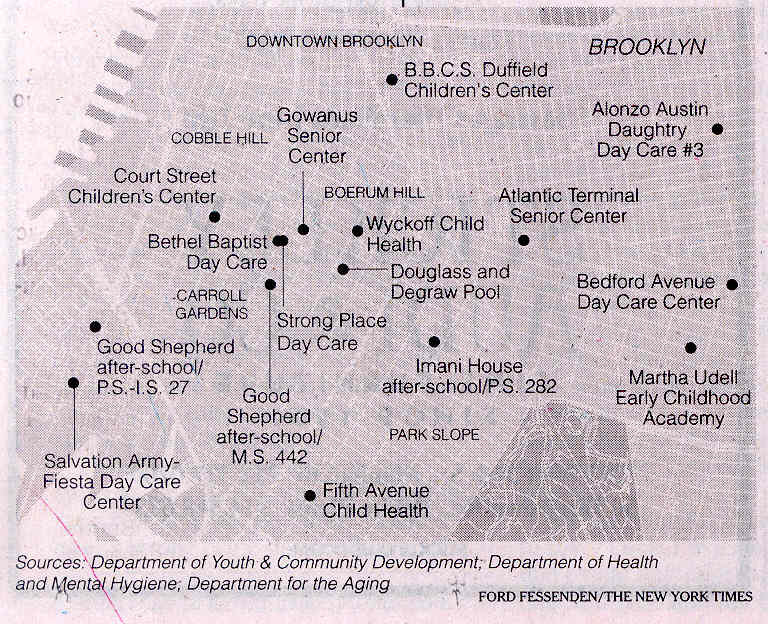 The only dollar figure in the story for what’s being saved is $624,000 in “annual rent” for the Bethel Baptist and Strong Place day care centers on Hoyt Street which are being closed, according to city officials quoted the article, because the rent is too high and “the increasingly upscale neighborhood no longer needs as many slots for children from low-income families.” The proposed Atlantic Yards megadevelopment and the $2-$3 billion in government funds in the midst of all this goes unmentioned. 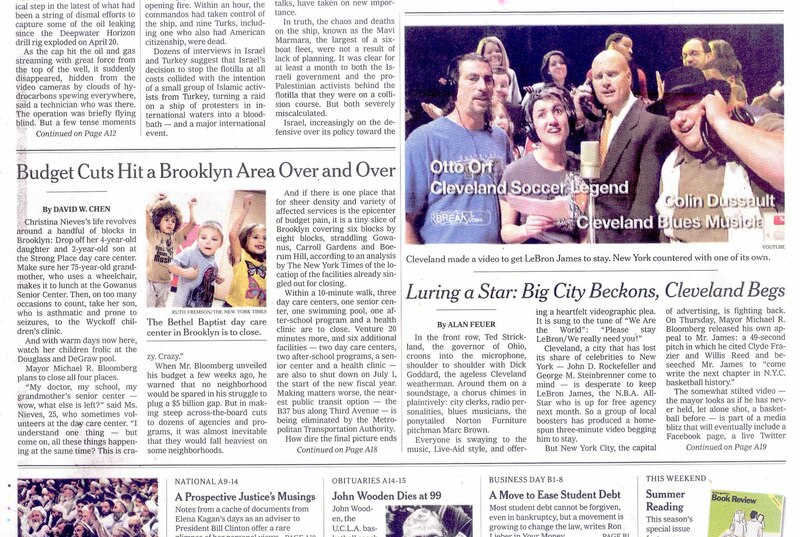 The article about luring basketball star LeBron James to New York is bizarre in that although it is a front page story on the subject it never mentions where he might play or for what team and thereby also doesn’t mention Atlantic Yards, the Prokhorov/Ratner arena or the Nets. By not mentioning Ratner or the Nets the Times gets itself out of one bind which would be the obligatory mention that the Times has a business relationship with developer Bruce Ratner, co-owner of the Nets basketball team with Russian oligarch Mikhail Prokhorov. Or does that really get the Times off the hook? FYI: The other team for whom LeBron might play is the New York Knicks with whom the Times doesn't have a relationship. Does anyone seriously believe these handily furnished figures? If these figures are to be believed it leads to some interesting speculative math: If LeBron James come to play for the Nets, does that mean that the City Independent Budget Office’s calculation that the Prokhorov/Ratner arena is a $220 million net loss would have to be revised downward to $162.2 million net loss? Or would the figure have to stay the same because it doesn’t seem to matter where LeBron James plays, in the Prokhorov/Ratner arena or Madison Square Garden? Or is it the reverse: Does it mean that if LeBron James goes to play in Madison Square Garden (or doesn’t come to New York at all) that the loss that the IBO calculated for the Prokhorov/Ratner arena will climb from $220 million to $277.8. Thankfully, you only have to worry about calculating these figures if you think the economic development figures calculated on demand for Bloomberg in connection with these frivolities aren’t rather contrived. "The Poor Stay Poor, the Rich Get Rich"
Regular readers of the Times know that the Times consistently makes a conscientious effort in laying out its stories in the print edition to pair stories with overlapping content where the facts of one will inform the facts of the other. We don’t think that they made that conscientious effort in this instance or that the Times was even conscious of the weird juxtaposition. The fact, though, that this great city newspaper could conceivably have been so unconscious about what is going on with development in the city is deeply scary. Think of the coverage that would be possible if the Times woke up to its responsibilities and did its job!